A Last Year at Vivians sees the welcome return of two favourite characters to the school. Rosemary Pearse is delighted to be returning from looking after her mother for one final year in the sixth form. She knows she can’t hope for a prefectship but is dismayed to find herself one of only four Sixth Form girls with no position at all. The head, Miss Lawrence, assures them they will each find their way to shine, and they do – though some in the most surprising ways. Meanwhile, Tammy Dunbar, the heroine of Left until Called for at Vivians, is facing her last year at school because her missionary guardians are coming home and want her to start work. Resiliently, and without fuss, Tammy sets about making the most of the time left to her and equipping herself for a job, with sympathetic help from the school. 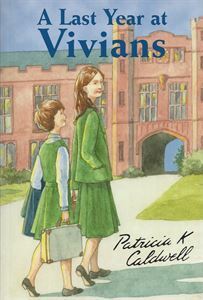 Patricia Caldwell’s fifth Vivians story is infused with humour, excitement and quiet courage. Previously published privately, this edition has been extended and revised, and includes a preface by Patricia and an introduction by her husband. This is not the last Vivians story, there will be more.